Besides from grabbing away the award of best airport fashion and being the most viewed member of year, Jessica also waltzes away with the Brand Loyalty title with her favourite French brand — Chanel. Let’s see how how Jessica styles her outfit with various Chanel items that are worth girls to die for! The most viewed member of the year on Soshified Style. The winner of the Barbie Award from the Korean media. The Ice Princess who never gives the cold shoulder to fashion. All these personify Jessica, and in addition to all those superlatives, she also handily walked away as our winner for the member with the best airport fashion. From the terminal to our hearts, Jessica constantly strutted her stuff in some of the best outfits on-display rarely suffering from wardrobe malfunctions. With her famous Linda Farrow sunglasses always at the ready, Jessica walked through crowds like nobody was watching, doing so with an air of elegance…and with a manager in tow. She showcased many brands throughout the year some examples included Chanel, Celine, Prada, Coach, the list goes on. Jessica somehow managed to make each brand fit, even when it shouldn’t have and did it with her famed “bored but beautiful” look on her face every time. From all thank you for wowing us on a regular basis, and congrats on being our Airport Queen this year. Girls’ Generation’s ‘Ice-princess’ Jessica takes the title this year for ‘Most Viewed’ on Soshified Style yet again. Our consecutive winner raked in the majority of views out of all 9 members this year no doubt thanks to her consistent off-duty style and growing bag collection. The task of dressing for a highly profile airport appearance is not to be taken lightly. To consider: photo-logs, awaiting fans, flight time and of course repeating the same process in a different location upon arrival. Never one to disappoint, Jessica always provides us with a well put-together outfit when making public appearances whether it be at the airport, on a TV program or at a fan-signing. 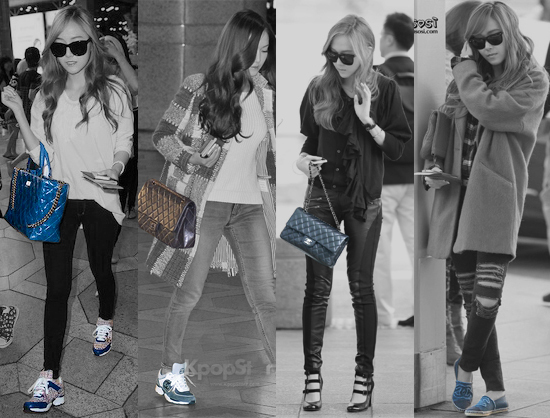 As if you needed another reason to crush on Jessica’s fashion style, her bag collection leaves nothing to be desired. Amassing a vast collection over this year, Jessica’s taste in expensive high-end bags has left us envious of the beautiful leather totes, to-die for Chanel shoulder bags and feeling light-headed at the Hermes bags. Needless to say, many fans anticipate to see what Jessica’s next fashion-forward moment will entail. With enthusiastic variation and confidence in the fine art of ‘less is more’, Sooyoung is crowned the winner for this year’s Red Carpet Style. From effortlessly chic in a pair of jeans to classic feminine in a-line skirts; Sooyoung has had us applauding throughout the year with her constant new takes on what to wear to public events. Though Sooyoung’s red carpet moments consist mostly of brand events and movie premiers, but that does not mean there is a lack of stunning outfits. Sooyoung has a knack for making everyday outfits stand out in order to grab your attention. For example, one of the things that set Sooyoung apart from the other nominees for this category was something as simple as pants. While rarely seen on the other girls at official events, pants have been a staple item for Sooyoung this past year. Though always skinny, the pants have ranged in style from classic denim washes to military camouflage and sparkly sequins and have been utilized as a statement piece that elevates a whole entire look. As for gala appearances, Sooyoung has had two this year (so far), donning a floor-length, minimalistic gown for one of them, and an almost impossibly short dress with a deep neckline for the other. Mixing it up just seems to come naturally to her and Miss Choi is not a one-trick pony. When it comes to colours, we can see this years palette has gravitated towards the monochromatic range from black via gray to white, and a wide array of blues. Where other colours do pop up they are in general kept muted. Congratulations to Sooyoung for cinching the title of 2013′s best Red Carpet Style!